Animals feature in cartoons in two ways; often as a ‘prop’ (eg as a background farmyard animal, like a horse being ridden, a dog being talked to) and sometimes as the central character of the cartoon, (eg Mickey Mouse, Garfield, etc). Cartoons of animals do not need to be terribly accurate, and are often funnier if they’re not. So long as the basic features of the animal are recognizable to distinguish it from other animals, eg an elephant’s trunk and body, a mouse’s nose and tail etc. Where to start? We come back to ovals and sticks, as with humans. Ink in with felt-nib, and erase the pencil when ink is dry. Take note of the way animals, (in this case a dog,) sits, stands , looks, scratches etc. Try different dog or cat types in different poses. Most animals can be based on a common ‘formula’. 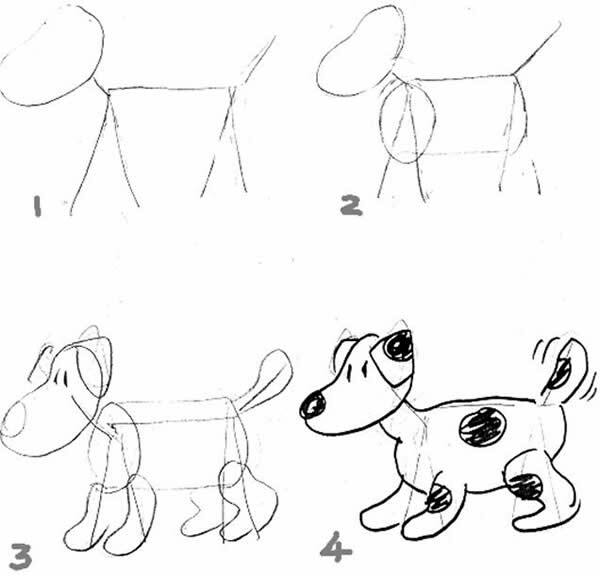 Copy these then do 10 animals of your own.